RESTHeart has been designed and developed with lightness and performances as fundamental parameters. 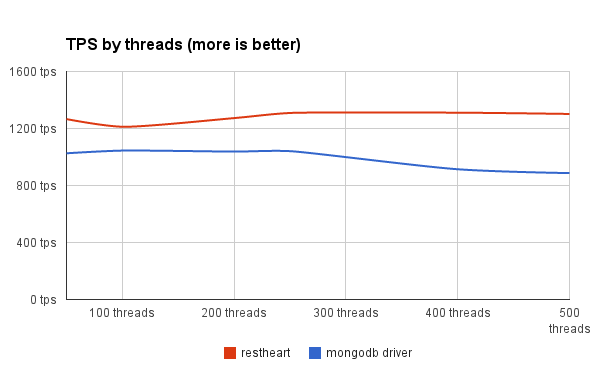 On this regards, also thanks to its caching capabilities, RESTHeart often overcomes the results that can be achieved accessing MongoDB directly via its Java driver. This section includes the performance test results gathered by the SoftInstigate’s development team and includes all the information needed to autonomously reproduce the tests. 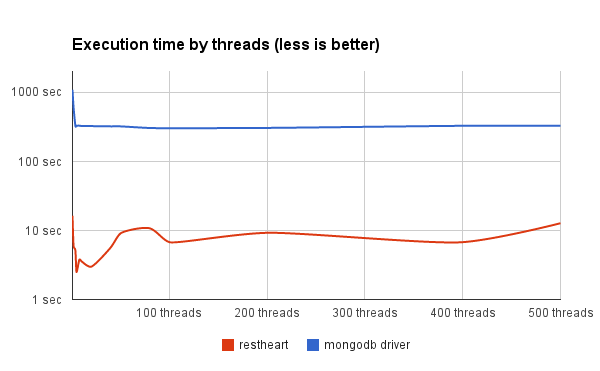 Measure the execution time to create 1 million documents with random data, using 200 test threads. Measure the execution time to query a collection 100.000 times, getting 5 documents each time (limit 5) and skipping just 25 documents, under different concurrency levels. Measure the execution time to query a collection 2.000 times, getting 5 documents each time (limit 5) and skipping just 250.000 documents, under different concurrency levels. Measure the execution time to query a collection 500 times, getting 5 documents each time (limit 5) skipping more and more documents each time, with a concurrency level of 4. 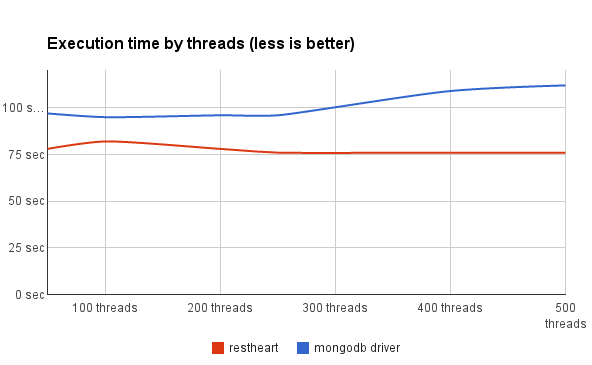 Thanks to the eager pre-allocation DBCursor engine, queries with significant skip parameter executes much faster (up to 470 times in this scenario) with RESTHeart. 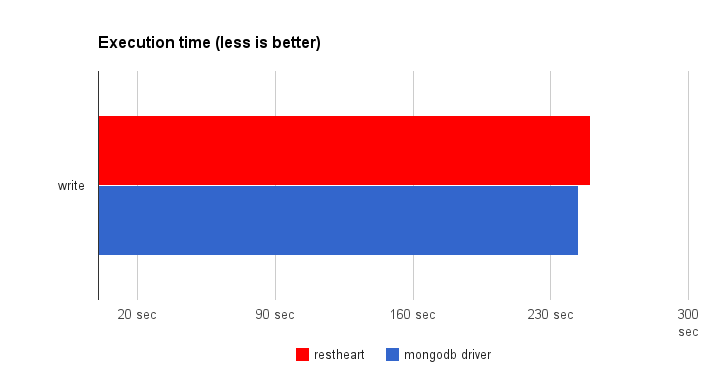 MongoDB and RESTHeart running on Sunfire X2200 M2 with 2 CPU with 16 Gbyte of RAM. See full specification here. This is an old server with 2 dual core 2,2GHz AMD Opteron CPUs. The client and the server on the same local network linked by a 10/100 Ethernet switch. 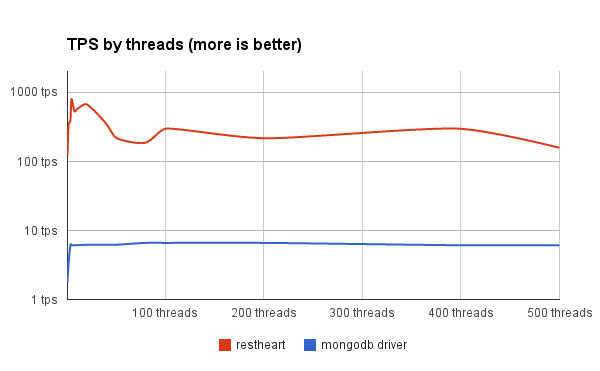 We used the brilliant load test tool. The test case code is available on Github as part of the RESTHeart source code baseline. You can find it here.